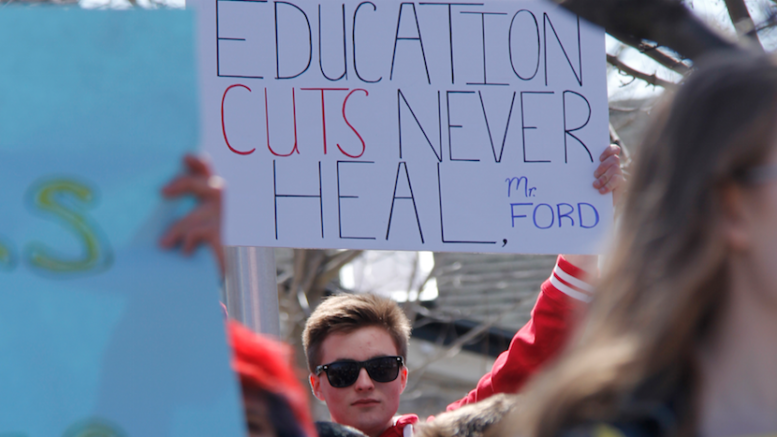 Almost 200 Prince Edward Collegiate Institute students joined in with counterparts across Ontario on Thursday afternoon to protest proposed changes to education by the Ford Government. Students walked out of classes at 1:15 p.m. And marched to Picton’s cenotaph where they listened to messages of concern and calls to action from a pair of organizers and encouraged motorists to honk their horns in support as they travelled by. Kayla Zachariah and Talia Epstein were among the handful of PECI students who heard about a student-initiated action day counter to announcements by the province that class sizes will increase and e-learning will be mandated, among other cost cutting initiatives proposed by the Ministry of Education. The organizers said they were impressed by Thursday’s turnout which was peaceful and respectful in nature with members of the Prince Edward OPP providing some oversight at rally grounds and along the route between the cenotaph and the secondary school. “We are impressed with the turnout today, we were hoping for 100 students and this is double what we were expecting,” Zachariah told the Gazette. “It’s really incredible, we have great faith in the students at PECI but we did not think they were going to make this a reality like they have today,” added Epstein. 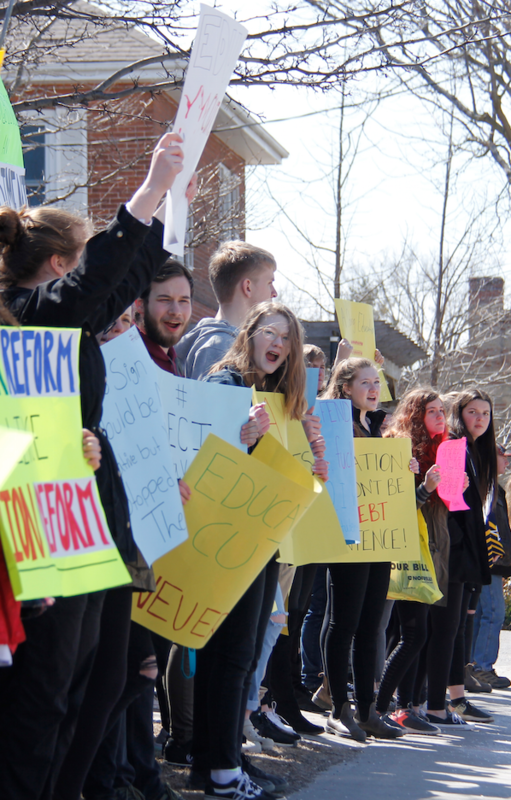 Epstein added that protests like these are vital to starting a conversation where the concerns of students are addressed by the provincial government. And students that were chanting phrases like ‘Our Education’ and other slogans against proposed cost cutting measures to education by the province seemed to be well educated on what was facing them when they return to class in September. PECI student Case McFarland said he and his classmates were gathering to stand up for the quality of their education on Doug Ford’s Ontario. He added there is unity amongst all students not matter their interest and learning paths. “Everyone in the school is going to be negatively impacted. I know the arts are being targetted and while I’m not much into arts, there’s lots of kids at our school that are so it’s important that they have their voice in all of this,” said McFarland. In her remarks to the assembled students, Zachariah denounced the e-learning initiative by stating it was a methodology that not all students can learn by. By 2020-21, it’s expected that all secondary students will need to complete a minimum of four e-learning courses by their graduation date. Epstein said no one involved in the education would be exempt from feeling Premier Ford’s suggested policies and all would be negatively impacted. 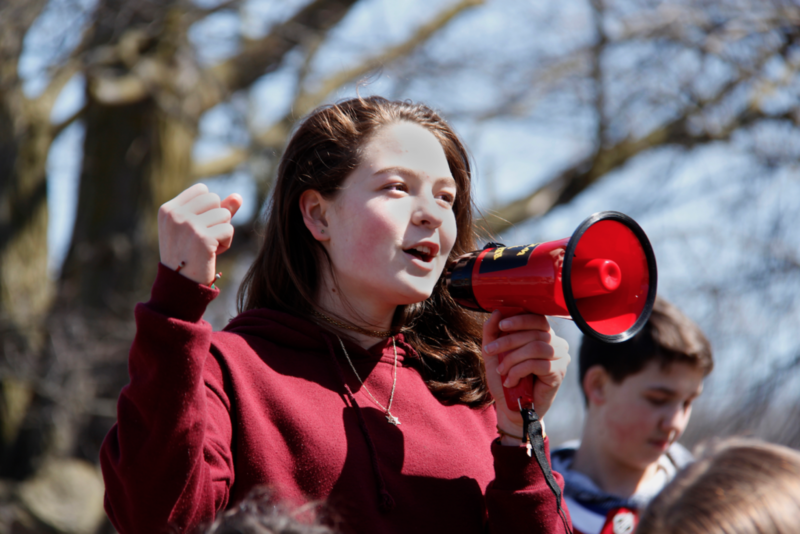 But throughout history, individuals that care and speak out have been the catalyst for societal change and this movement to protect Ontario’s high quality education is gaining momentum. On hand to support the students and watch part of the protest was former County of Prince Edward mayor and Bay of Quinte Liberal candidate in the most recent Ontario general election Robert Quaiff. Quaff said he was impressed that secondary students are so well engaged as to what the proposed cuts in the education system will mean to the young people in the near and distant future. “They understand what the cuts mean and under the previous government, these cuts wouldn’t be happening because the Ministry of Education used science and research to improve learning conditions and methodology. What’s proposed right now is devastating to these students,” Quaiff said. As spokesperson of the Bay of Quinte Liberals, Quaiff said he had a chance to speak with Steven Del Duca, a potential party leader that made a stop in Picton to great the party faithful earlier in the day. Quaiff admitted that he didn’t expect as much civil discourse in the province over the early months of the Ford Government as there has been. “In speaking with (Del Duca) today, even he said ‘We haven’t seen as much devastation in such a short period of time’ and we are concerned there’s only more to come,” Quaiff said.